If you have ever surfed without a surfboard leash, you understand why having one is so important. There is nothing more frustrating then having to chase your board all the way to shore after a fall. The same can go for having a surfboard leash that isn’t compatible with the conditions that you are surfing. If you have ever broken a leash in big surf you understand what I am talking about. Over the years I have owned a number of XM Surfmore products and have found that they have one of the most extensive surfboard leash categories on the market. One of their more popular surfboard leash options is their double swivel surfboard leash. This leash comes in a variety of lengths and cord diameters that determine the strength of the surfboard leash and which board and surf condition it goes best with. XM Surfmore basically makes 4 styles of the double swivel surfboard leash, which include the Ultralite, Complite, Regular and Big Wave models. The Ultralite model is made for smaller surf, the Complite for medium surf; their Regular leashes are for large waves and the Big Wave model is pretty much self-explanatory. In my experience with XM leashes I have learned that each surfboard leash is designed for what they say, so you shouldn’t try and cheat the system. Last winter I surfed heavy surf with my Complite surfboard leash (made for medium waves) and it snapped in half. If you think that you will be surfing larger waves I would recommend getting the Regular model surfboard leash. I have one that I use when I surf in California, and I have had it for years with absolutely no problems. 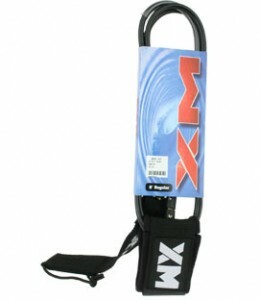 Check out more XM products including their double swivel and other surfboard leashes at Surfmore XM.